You might think you know Japanese food, but a meal at Morimoto, Napa Valley will change that. Chef Masaharu Morimoto is truly a Japanese master among masters! The restaurant's interior was modern and vibrant, represented by the exotic hardwood tables and sleek wood cabinets. The menu was nothing short of amazing, with bountiful choices to choose from. After flipping through the menu back and forth, we decided to go with the Omakase (US$120). The furniture were sleek and modern with a touch of urban Japanese sense. Did you know that the Iron Chef has his own line of sake, shochu and beer? He even has his own line of utensils! Morimoto's executive chef, Jeffrey Lunak who helped opened the restaurant back in summer 2010 was at the kitchen that night. Would you like some Morimoto sake? Chef Signature Toro Tartare - The fatty tuna was served on a wooden tray with nori paste, fresh wasabi, sour cream, chives, avocado, rice balls and soy sauce as delicious condiments. A spatula was used to scoop the thick creamy toro. I really enjoyed mixing all the different condiments together - Such a fun way to start a meal. The Chef also left a yamamomo or mountain peach to clean our palate. Yellow Tail Sashimi drizzled with light sauce and garnished with some greens and garlics. The carpaccio dish may be simple but the flavors were vibrant. Veggie fondue - Beautiful assortment of vegetables served next to an oil fondue with garlic anchovy paste. This was my favorite dish - the fondue was brilliant, I could literally lick the bowl clean! Close up look of the anchovy paste in olive oil. Love the idea of fondue-ing in a Japanese restaurant. In addition to the omakase, we ordered a portion of Bone Marrow. The slippery marrow was crazy good with the baked crust. Foie gras Chawanmushi - This egg custard was infused with foie gras soup, topped with a tiny piece of duck breast. The texture and taste were amazing. Pure decadence! Watermelon wasabi sorbet was presented as a palate cleaner - Such a stunning sight. Can you see the strawberry? No omakase would be complete without a sushi course. The fish was top grade, perfectly cut with a nice portion of rice. Surf and Turf - Willington chutoro wrapped together with foie gras and unagi (Left), waygu flatiron with sea salt (center) and veal cheek tempura served with pickled red onion and onion foam (right). The complex blend of flavors went perfectly well together. Bubble tea with scoops of green tea sorbet mixed in an icy carbonated lemon grass soda water. The coconut macaroon was nutty and crispy with a super soft center. Both desserts were heavenly! At Morimoto, expect nothing less than stunning platings and pristine dishes with a distinct Japanese accent. Moritmoto definitely takes it to the next level. I'm so jealous! :D Everything looks HEAVENLY!!! Especially that Toro Tartare! The meal exceeded all my expectations. It was crazy.. Yes, you will find Mexican, French, Asian and Western influences in his cooking. He is a genius! Having dined in quite a bit of Jap restaurants over here, I have not seen these wonderful food you have shared. Simply divine and gorgeous but that price looks killer. It was divine. Honestly the price was quite fair (if you don't convert). I don't think you can get anything like this in Malaysia for RM120. Awesome! 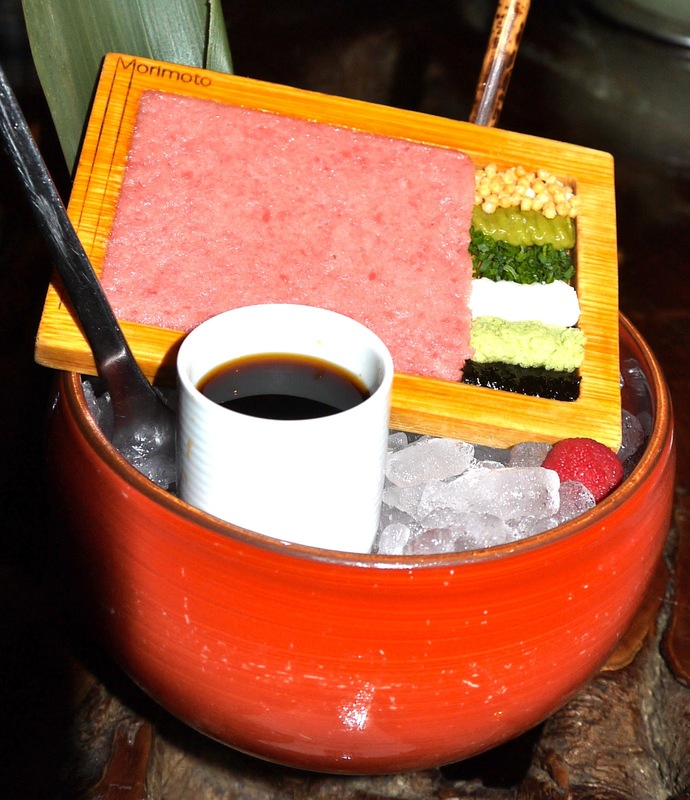 The toro tartare is simply awesome...I wonder who serves this in KL? Yes...actually i thought it was quite out of place.. hahhaha. Yes.. who will expect to have bubble tea at a Japanese restaurant.